During October 2015 a series of monsoonal storms tracked north from Mexico over the Mojave Desert into the Death Valley National Park region. Precipitation in the region occurred on October 4 > 5, 15 > 19 with flash floods on the 19th. Although the only official weather station in the park at Furnace Creek recorded just 1.23 inches in October, the nature of such thunderstorms is such that rainfall is highly variable. Within the complex terrain of the park with several mountain ranges and deep valleys it is certain that far more rain occurred in isolated mountain areas. The storms made national network TV news with videos of flash flood destruction at Scotty's Castle and several park roads. Some park roads were repaired by Christmas while others will remain closed for months. Of particular note concerning the bloom areas, highway SR178 eastward from Shoshone which becomes the Jubilee Pass Road inside the park remains closed. As a result, the bloom areas can only be accessed by normal passenger vehicles by 90 mile out and back roundtrips from the SR190 junction near Furnace Creek. Death Valley is one of the driest locations on the planet. The average October rainfall for Furnace Creek is just 0.11 inches and the annual average 1.94 inches. Actually during most Octobers no rain at all occurs so that is the result of averaging occasional higher precipitation events over several years without any rain. When such rains do occur every few years, plants have evolved to make the most of that water. NWS averages for Furnace Creek 1911 thru 2007.
precipitation .11" .18" .19" .27 .35" .25" .12"
Following those storms I commented on web forums that the rains could mean wildflowers would rise again. Having visited twice during the bloom of the century in 2005, I was hoping for another event. The big question for this person was, did the major bloom areas of 2005 where dormant seed beds lie actually receive substantial rains during that storm? The 5270 square mile park is the largest in the United States but has just a single weather station at Furnace Creek. The only other way rainfall in the region can be vaguely estimated is via the distant Las Vegas NWS radar which is limited due to intervening mountains. The key nugget of information following news reports was that the Jubilee Pass paved highway which is near the most impressive wildflower areas of the park, was one of the roads apparently with flood damage because that road was closed and remained closed. Unlike dirt roads that are readily eroded away by flash floods, when flood debris covers paved roads, it usually does not take long for bulldozers to scrape off layers of mud and sand from their surface. The fact there was more serious damage, probably pavement erosion, tended to mean that zone did indeed also receive heavy precipitation. I knew seeds would germinate and start showing in about a month as small herbs and as expected by the Christmas holiday period there were reports of greening in the park. With the most intense El Nino in modern times expected to make for some level of interesting weather in the Southwest, there was much to be additionally optimistic about. Subsequent images appeared to show drought limited plants all about the same height that is what one would expect from plants that had just one big drink and later a single small drink. The LA Times featured the park in a story on a possible emerging super bloom. That would generate increasing visitor interest and more reports that I hoped would enlighten what was really going on. Without more rainfall I wasn't quite ready to make the long 500 mile each way road trip. Big news this week is that it rained .32 inches on Sunday (Furnace Creek). We got that nice soaker that we needed. It's gonna be a fantastic year, folks!It's pretty great right now. The good news is the Badwater Road is looking good throughout its length, but gets better and better the further south you go. The bad news is that the rain we received Sunday has caused a temporary closure of the Badwater Road south of Badwater. Enough rain that the paved road had to be closed due to flood debris! That was enough for me to trigger a trip that I announced on the Yahoo calphoto groups web site. My expectation was that plants would need at least a week to absorb the new water and then put it into new green growth and buds into flowers or for new plants to emerge and increase the overall greenery. Upon evaluating weatherunderground.com 10 day wind forecasts set dates at short notice beginning Thursday afternoon February 11 with a return on Tuesday February 16, a 5 day trip. Monday was the Washington's Birthday holiday. It was absolutely key that forecasts were for at least some periods of light winds because such is absolutely necessary for making large landscape images with high resolution foregrounds. Some others were making plans for March however most of the annual plant seeds from the 2005 super bloom had already risen much earlier than in 2005 and plant cycles of the blooming showy species would not wait that long so I expected the peak bloom would happen as soon as the recent storm's water was absorbed. 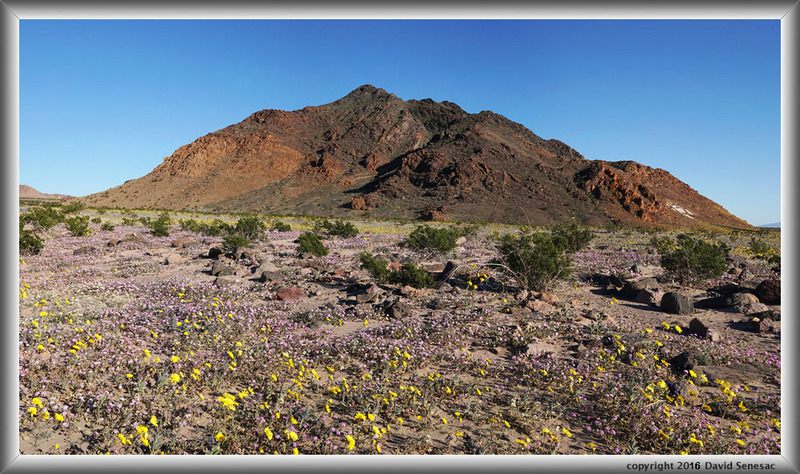 A general comment on density of annual wildflower blooms whether at Death Valley or elsewhere is that the amount of rainfall during the winter season is not the primary factor in the density of blooms in a given area but rather it is amount of dormant seeds in the seed bed. In other words if a localized area receives 300% of normal precipitation but only has a few annual seeds, then there can never be more plants that germinate than those numbers of seeds regardless of the amount of rains. But an area like the Jubilee Pass plains that has vast numbers of seeds from 1998 and 2005 events does have the potential for dense germination if and when precipitation and temperature during a winter are adequate. That is why best blooms tend to occur in the same locations each winter above average rains occur in a region. Seeds some years may germinate due to early rains only to be wasted by drought instead of blooming, and thus decrease available seeds in an area. In subsequent winters if record heavy rains occur, resulting blooms may only be modest because the seed bank was reduced and it may take years or decades for the seed bank to build back up to reach super bloom levels. 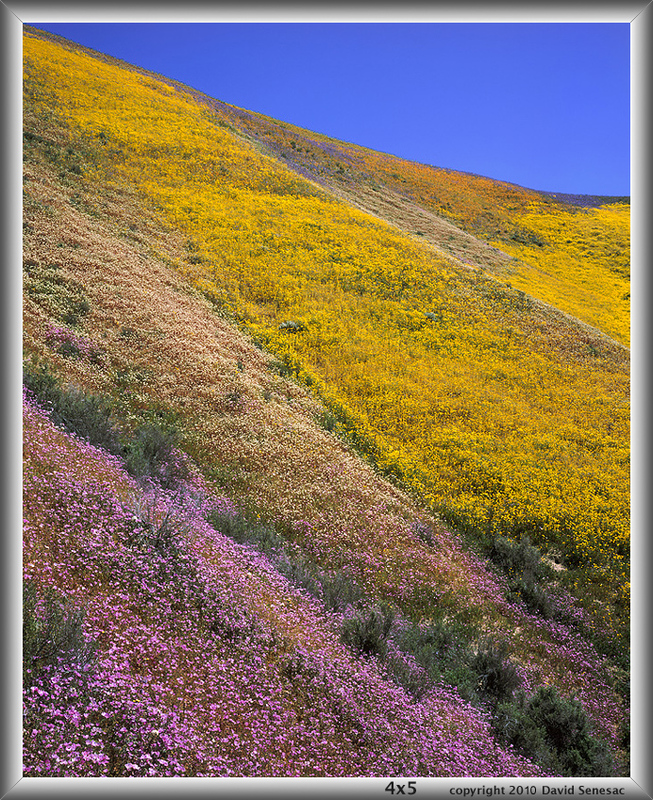 The 2005 super bloom had a large seed bank from 1998 to bloom from. In any case, what when how much blooms occur is the result of complexities beyond the terse notes above. As someone about in the field for decades, having personally seen many locations in the state where dense blooms of species occur in wet years, it is a significant advantage in knowing where to find flowers in subsequent wet years. After the October floods I had made an extensive analysis of the park via maps, guidebooks, and Google Earth and discovered some very interesting terrain in northern sections of the park for photography that I expected none or few others have ever set tripods up for. 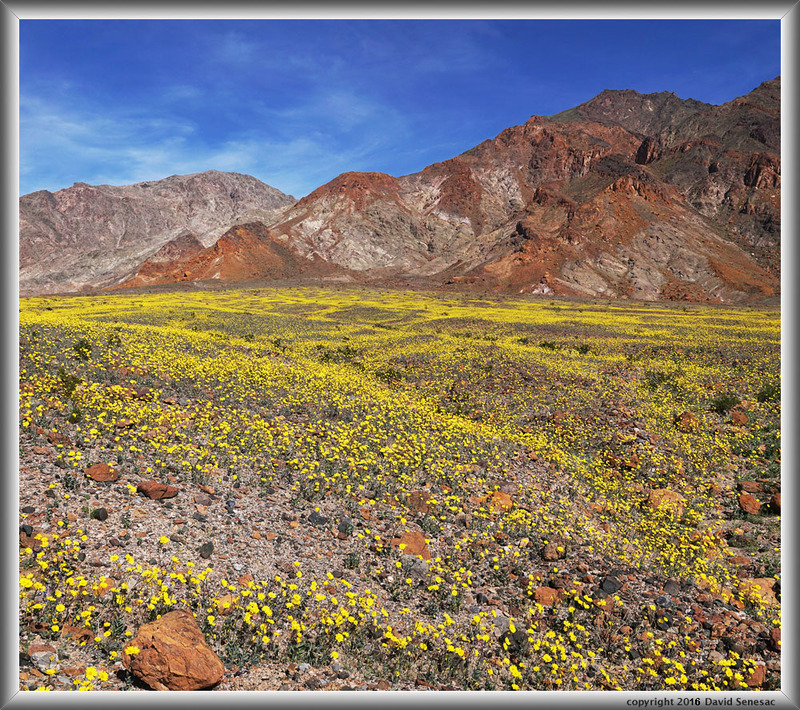 Accordingly I would need a week for those areas but that was not going to happen on this early trip and instead would concentrate fully on just the southern Death Valley wildflowers then return for the northern areas after mid March. A flexible call I'll make at that time dependent on weather at short notice. After a pleasant very comfortable and quiet night inside my Forester, awoke early dawn Friday February 12 and excitedly drove off and was soon going east on SR190 up and over Towne Pass at 4965 feet then down the long 15 miles or so downhill slope to Stovepipe Wells at just above sea level. What a terrific early morning coasting bike ride that could be! Still in winter dormancy, roadside were small green herbs but not flowering annuals. I reached the Stovepipe Wells community as warm sunlight turned clouds above nicely red. Quite a number of cars, many no doubt photographers, were parked at the Mesquite Flat Sand Dunes parking lot and I could see their ant-sized bodies contrasting against the white dunes. Further east at the Scotty's Castle Road junction, desertgold sunflowers began to appear and would be patchy for the following several miles to Furnace Creek. There were more up north than I had expected but much less than I saw during the first week of April in 2005. In any case an optimistic sign that rainfall had been widespread. 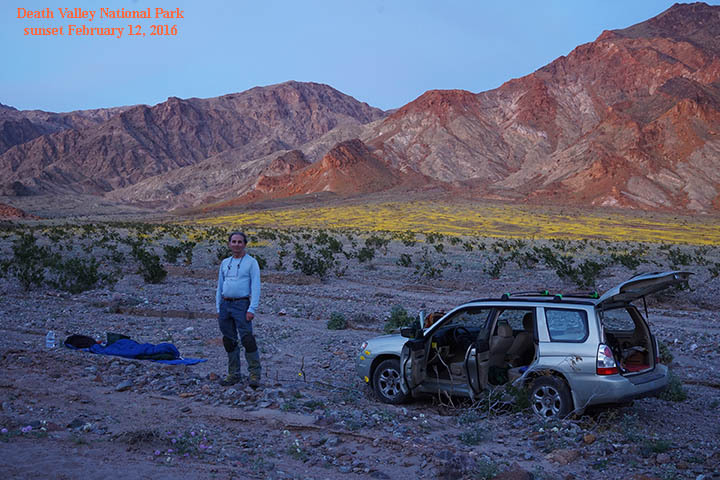 At Furnace Creek that is 194 feet below sea level, I stopped at the gas station to top off both gas and my 5 gallon water container then was quickly off south eager to reach the southern flower fields 30 plus miles further while morning light was still good. Between Furnace Creek and the south end of Artist Drive it appeared little rains had fallen as there was little green. 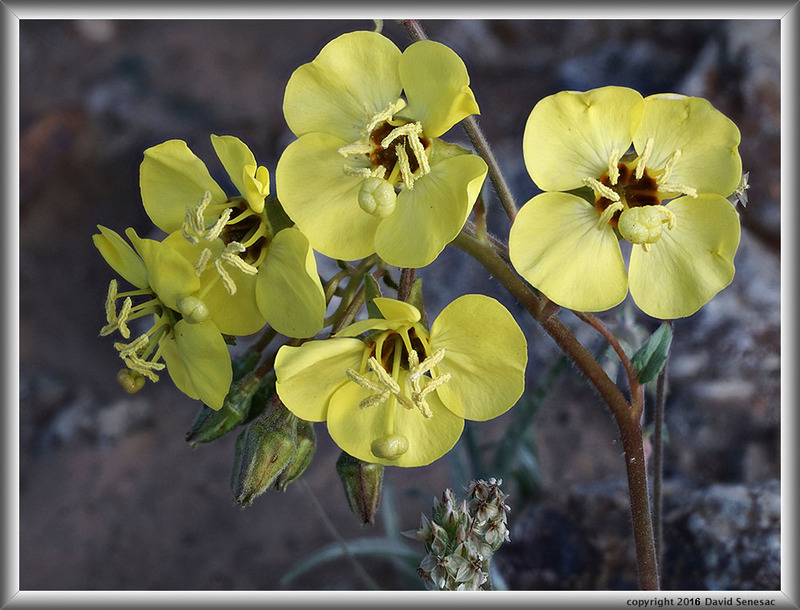 From that point south desertgold and brown-eyed evening primrose increasingly appeared. 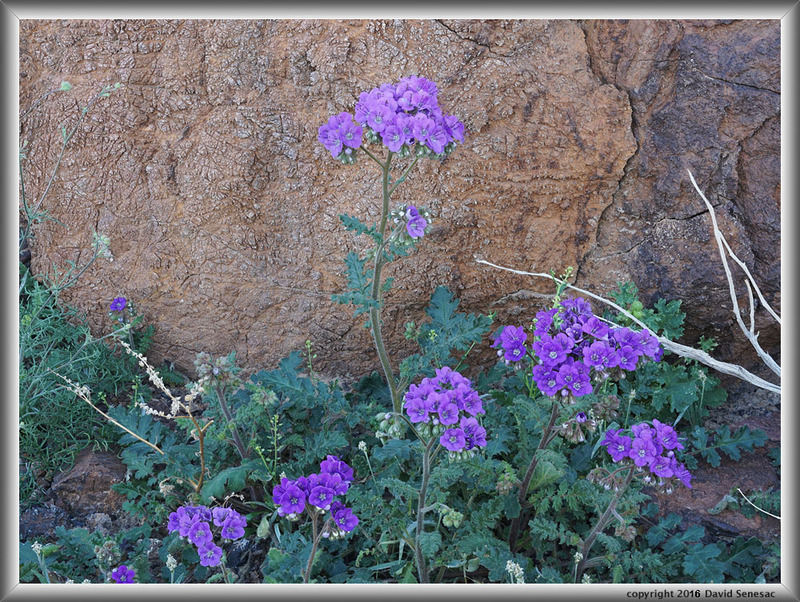 It was at the Copper Canyon bajada that I came upon the first dense flower fields, just as was the case in 2005. However photographic light was still much too shadowed. The area would be best at mid morning so I entertained expectations of stopping during the morning of my return leg a few days later. Since what had been a slight breeze came to a complete null, I did stop at the alkali salt pond a mile south of Mormon Point for the below modest reflection of the southern section of the Panamint Range. With my Sony A6000 24mp mirrorless body with Sigma 60mm F2.9 DN lens atop a Nodal Ninja III MKII panoramic head atop an Induro CT113 carbon fiber tripod with a Manfrotto MH054M0 magnesium ballhead, captured 4 columns by 1 row frames in camera landscape orientation for stitching. That created a long narrow image file of 18900 x 4000 pixels. 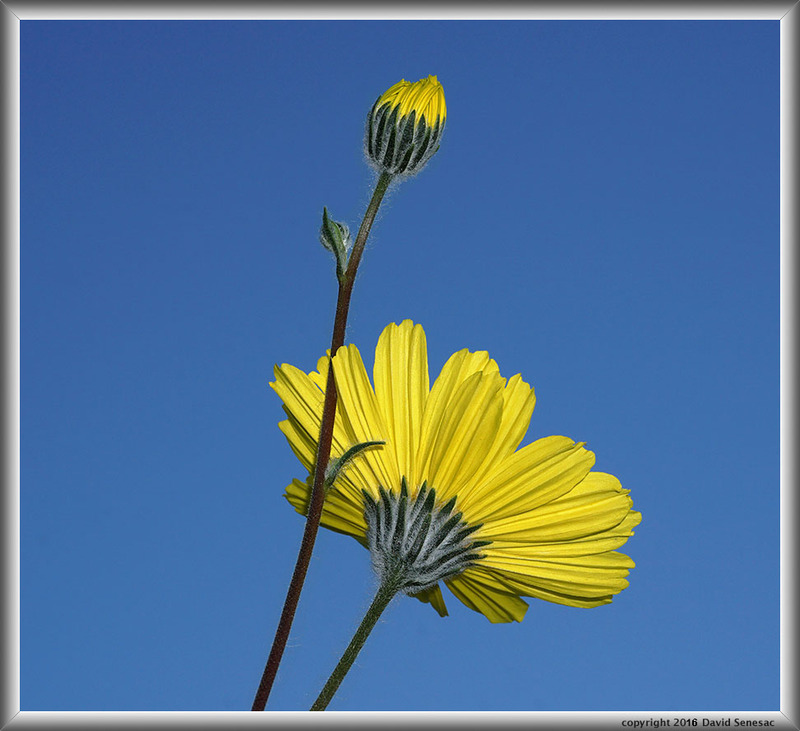 By selecting the enlarged 33% horizontal slice view, the yellow flower areas are much more evident. The white band just above the pond edge is the Amargosa River bed that in wet years may be part of Lake Manly. There was still lingering snow at highest Panamint elevations from the cold January 31 storm. Lake Manly unlike in 2005 when the water covered extensive areas of lower Badwater Basin, was now just white alkali salt flat expanses with a few areas of shallow surface water. A few miles further south I stopped to hike an eighth of a mile up a wash with desertgold and sandverbena but then a strong southeast breeze began that would increase through mid day and last till mid afternoon. Along the way noticed my moto g cell phone had popped out of its case at some point that put me into panic mode. The rocky cement like bajada surface left few footprints and there were many small cell phone sized rocks scattered all about so trying to backtrack along my same path was difficult as would be noticing the phone. I imagined the unpleasantness of having to purchase then set up another phone and applications. Although the region was too remote for phone service, many of my maps, Google Earth images, and gear documents were on the phone including the full Timble Outdoors California topo map sdcard set I expected to use for the many areas I had not made actual paper map print outs for. Did not find it! Was this a bad omen for the rest of the trip? I marked the spot where I parked on the berm in the sand with a big X then drove the 4 miles back to the Mormon Point pond, and did not see it there either that was more a certainty because I had not walked far and where I did it was likely to stand out easily. So it had to be somewhere up the wash thus drove back south to make a second search. This time after walking just a few feet from where I'd parked, there it was right in the open! What a relief! Although the cell phone was unlikely to ever come out of my belt case under normal walking circumstances, it was obvious not so when rambling through jarring awkward terrain while being bumped and pushed by my waist pack and daypack I was also wearing so henceforth lesson learned, carried the phone inside my Everest waist pack. After that delay of more than an hour, light was becoming more harsh so I spent the following mid day hours surveying the flower fields including driving to the end of the Jubilee Pass Road at the topo 136.3 meter elevation mark that was gated closed for flood repairs. The Amargosa River that flowed during October floods had long since dried up so driving the popular West Side Road (dirt and washboarded) would not require the usual tricky ford. Only minor numbers of vehicles were about this Friday though I expected that to change for Saturday given the holiday. This mark up of the USGS topo shows the areas of most dense flower fields that is generally the low gradient plains and bajadas with wildflowers sparse in the flash flood scoured washes and steeper bedrock mountain slopes. The mapper.acme topo link above will show areas beyond. Paved Badwater Road runs south from SR190 near Furnace Creek over 40 miles to this area and has mile markers. The Harry Wade Road is graded dirt and navigable by any vehicle for at least a few miles before it crosses the dry Amargosa River channel that may be dangerously sandy. The Jubilee Pass Road is paved, goes east over Jubilee Pass, then Salsberry Pass, and becomes SR178 into Shoshone outside the park. However it has been blocked for repairs for months since the floods at the red rectangle. The grayed area there was an old picnic area that can be used for parking. The north facing slopes of the 2 peaklets just south contain lots of wildflower for those that can't walk far. Note the peaklet colored orange at its top on the map is the one pictured at page top. Generally there is adequate space to park OFF the pavement all along the two paved roads. The locations with magenta dots identify two washes I recommend walking with the west wash deeper with shade and wind protection. Although one will not find any shade roadside for dozens of miles, a person willing to make a short hike up this wash will find pleasant areas of morning shade along the vertical sides of the wash. The best time for these areas is not mid day or afternoons when most visitors arrive but rather early mornings when temperatures are most pleasant for hiking, breezes are more likely light, and photographic light is best. In the afternoon drove out on one of the several dirt roads in the area that after a modest distance becomes a 4WD only route. I'd surveyed Google Earth for colorful geology areas that might provide better backgrounds for flower fields and this ancient rust hued Paleozoic Era geology in the above image did not disappoint. Although part of the Black Mountains indeed has areas of very dark rock, other zones of strata are not dark at all with the above richly orange-red hues providing a superb background for the intensely yellow and fragrant desertgold, geraea canescens, sunflowers. When even mild breezes are blowing over flower fields I tend to use my 30mm lens taking fewer shots because flower movement causes stitch blending issues. To cover the same area with my 60mm lens would require taking 4 times as many shots with each shot requiring waiting for breeze lulls and motion blurring would be more visible. Later in the afternoon returned to Jubilee Pass Road areas but breezes remained unworkable and a significant dust cloud muted sunlight in western areas above Death Valley so returned to the dirt road explored earlier where I would set up a dispersed camp spot legally over a mile from the paved Badwater Road. Climbing up on a nearby point shot the above image with my 60mm lens that shows how desertgold concentrate in the shallow runoff gullies where water erosion and wind-blown sands collect while are less dense on the soil poor rocky intervening ribs where soil and sand is washed away into the hollows. That varying yellow pattern was a more interesting aesthetic versus a more common situation where flowers are evenly distributed across an area. The gray area at frame bottom is the large wash draining areas to the left of the frame and behind the first rusty ridge at left. The darker green bushes that are more common in the wash, are the most common drought resistant plant in our Southwest deserts, aromatic creosote bush, larrea tridentata, that were also often blooming during my visit though its yellow flowers are neither showy or stand out against the green foliage. Both this image and one above were unavoidably captured in a rather flat light direction. As a result the downsized for web versions displayed lack a 3-dimensional quality. However by viewing the enlarged vertical slice view, one will note the more detailed view displays 3-dimensionality better despite being in flat light and is a factor why serious landscape photographers always preferred large format cameras versus small 35mm SLR cameras. Below shows muted sunset light on the Black Mountains due to dust clouds in skies miles west at my camp spot. Blue ground sheet atop clean gravel sands, two sleeping bags used blanket style, clothing bag as a pillow, food, MSR stove, water, reading material and maps in a plastic box, flashlights, and very few creeping crawling things to worry about during late winter. Saturday morning February 13 I was again awake at early dawn then after securing gear in the Forester for the day drove off back down to the paved road and off south to a spot next to the first peaklet east along the Jubilee Pass Road. That is also the peak shown in image at page top. Two breeze flows met at this junction, one from the southeast down the Amargosa River valley and the other east from Jubilee Pass. It was at this juncture that this greatest expanse of wildflowers occurs in the park. Since it was too breezy for landscape work, I contemplated why wildflowers evolved in this area? When Pacific troughs leave the Oregon and Washington Cascades moving into the northwest Great Basin of Nevada, it fills the vast basin and ranges with cold pools of air that increase outflowing winds to the south at perimeters within the region. As a long time Tahoe resort snow skier, that regularly results in strong easterly winds for a day after fronts have passed east so my suspicion was the same forces were occurring here. On Friday such a minor front to the north had indeed done so into the Great Basin. 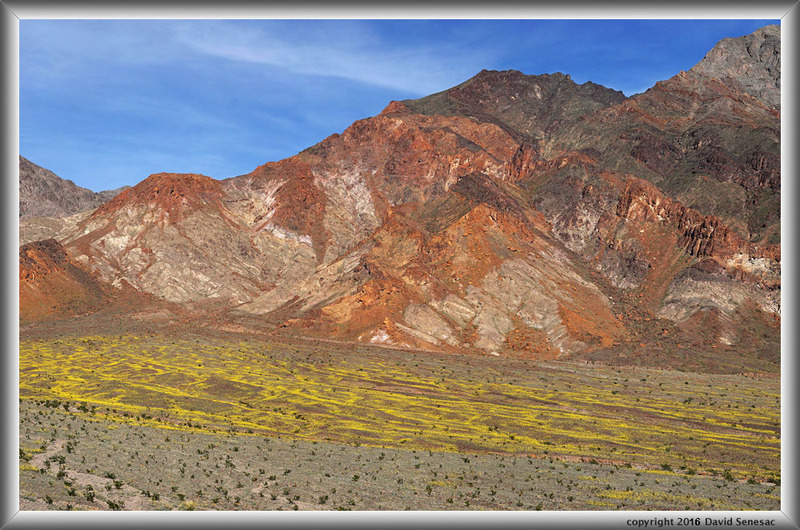 Just west across this section of Death Valley is the low dividing point of Wingate Wash between the Owlshead Mountains to the southwest and high Panamint Range west and northwest. It is across these areas which escape out to the Panamint Valley further west that wind can more freely flow so over millenia have eroded rock into sand that has carried onto these plains providing both more wind borne annual plant seeds and more sand and soils that land between the loose rock and bedrock on the plains for plants to grown on. The name Wingate was originally "Wind Gate" named so by borax miners using the route that were plagued by the Searles Lake area, an expanse of dry alkali extensively mined thus distubed. Additionally this zone, less blocked by higher surrounding ranges, probably receives more rainfall beneficial for vegetation because it is less in rain shadows. The Death Valley region a century plus ago back to the Mexican era was the center of considerable gold and silver mining and prospecting and as a result is pock marked by many mines and decaying ruins. All that activity was certain to have axed down any desert trees that might have existed in the region and even the woody strong scented creosote bushes. The mining activity itself required trucks and mule teams rumbling over terrain and damming various washes in attempts to store water, a rather fool-hardy notion. Thus one will wonder what the ancient landscape might have actually looked like a few centuries ago? Eventually I decided to try some close-up work on plants about a somewhat protected aspect of the peaklet that had lots of notch-leaf phacelia, phacelia crenulata. Using my collapsible diffuser and reflectors managed to endure pesky breezes enough to make 9 captures of the above subject for focus stack blending. The issue with such work is that when one blends several images, if any elements are not in registration, the result may show multiple edges. When a slight breeze moves vegetation like this, although it may appear plant stems and flowers bounce back to where they had been, at the high resolution magnified levels of current high end digital cameras that is not perfectly so. Before long I tired of waiting out momentary calm so as the sun rose up enough to provide better light for landscapes, abandoned that work, went back to the Forester, switched the camera from Benbo to Induro tripods, filled up my daypack, and set out on a long exploratory hike I'd decided on the evening before. 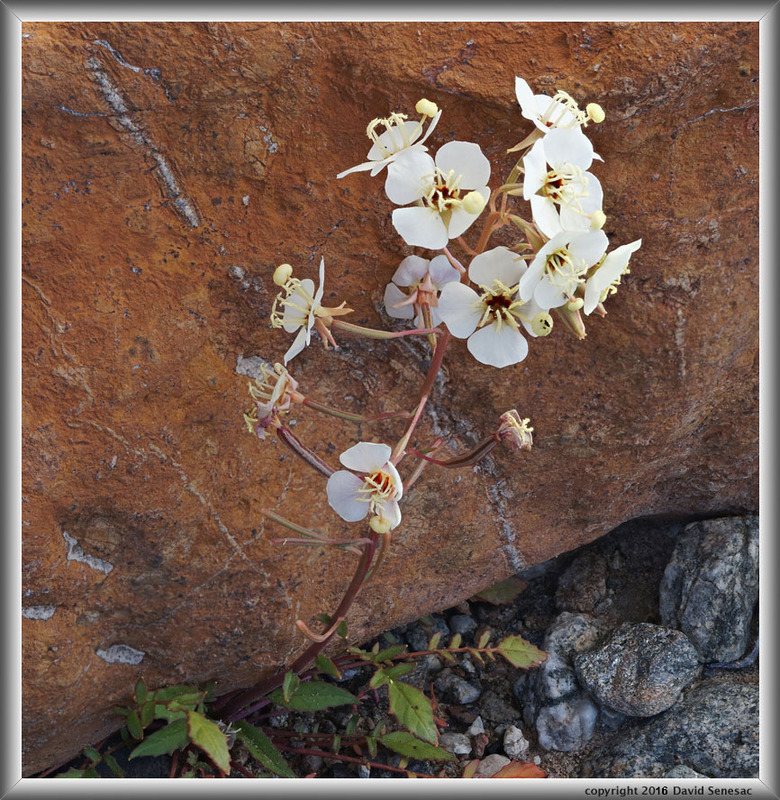 Along my route stopped at prospective late afternoon photo spots where flowers were most dense to possibly return to. Explored up a ravine I'd worked in 2005 then up and over multiple ravines and ribs. Hiking cross country on Death Valley bajadas and washes is rather tedious because the cement-like surfaces are irregularly embedded with variable small-sized rocks. 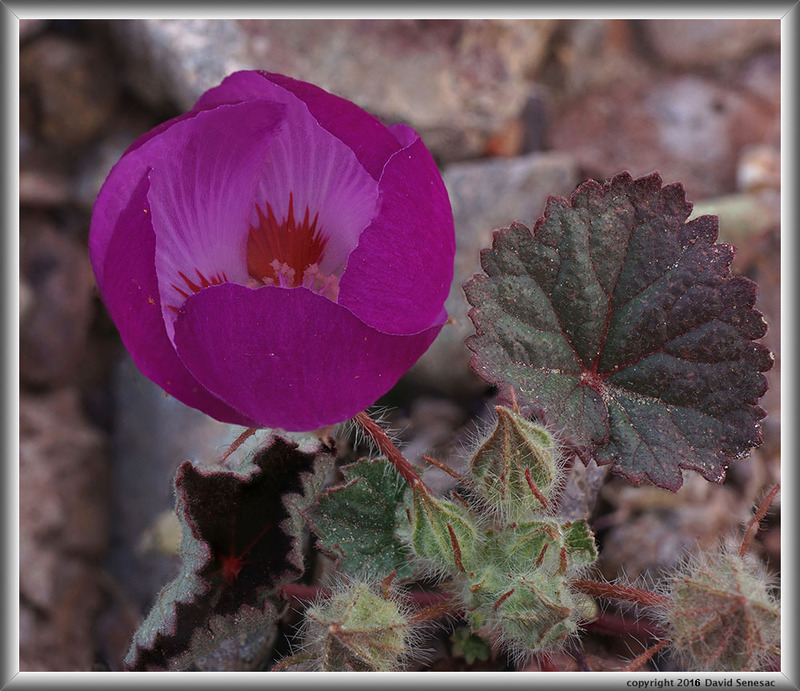 At one remote location some unusual color caught my eye and was looking at a novel deeply rose-magenta hue variant of desert five spot, eremalche rotundifolia. 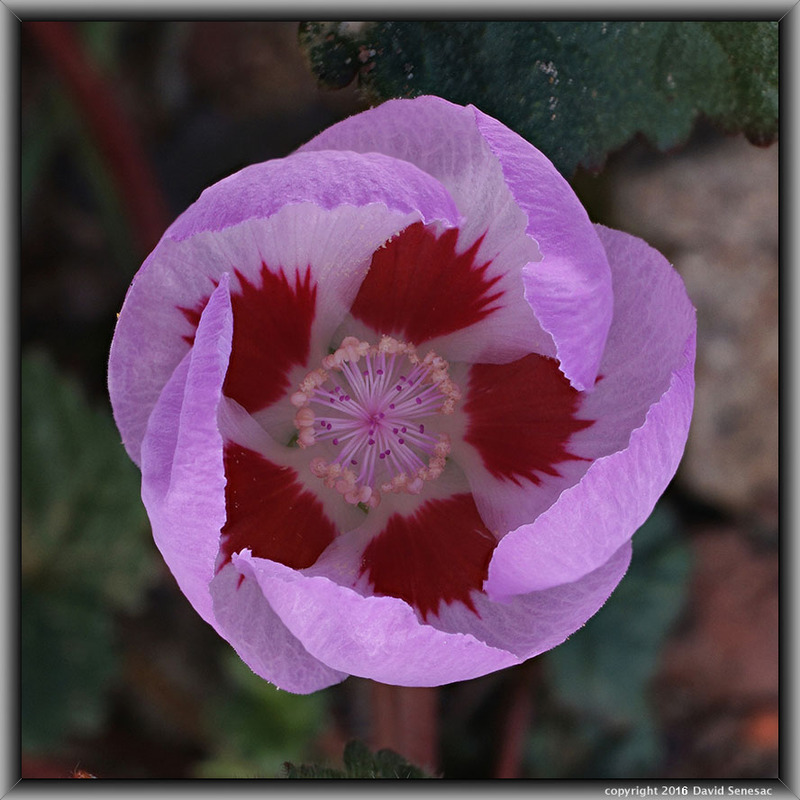 Searching around that same zone showed another couple of those variants among far more normal pink flowered plants. Thus the color trait was a seed strain and not a single mutation. Though in a rather awkward location for a photo, I managed the above 8 image stack set which was enough to bring the full bowl into sharp focus plus a few near buds and one very well imaged leaf while the background remained oof. Should we name this variation a Royal Desert Five Spot? Note for those unfamiliar with focus stack blending, adding a shot of the background in sharp focus would have only resulted in halo parallax issues around the flower so close to my 60mm lens. With traditional close-up camera technique, capturing the full flower in high detail sharp focus like this was impossible. Thus one might capture the bottom of the bowl in focus with the top of the bowl petals oof or vice versa but not both. The rest of this breeziest day of the trip was also the least productive photographically. At mid day with temperature in low 80s, dozens of holiday visitors had finally arrived with most jostling roadside for the limited parking at the paved scenic parking lot for the scant Ashford Mill gold mining stamp mill concrete ruins that has a viewpoint with a small descriptive placard plus a small restroom, the only facilities of any type for dozens of miles. The mill was built during the WWI era because of a hoax gold mine up nearby Scotty's Canyon that was merely a scheme to dupe investors. As is common behavior about many roadways of the nation's scenic parks, visitors tend to stop where they see other people stopping and milling about while ignoring the vast stretches between such people points even if they personally sense some aesthetic wonder. For many it seems to be difficult to stop by their own volition where no others are stopping. From the ruins to the end of the blocked highway is about 4 miles. Most vehicles would speed past a sign stating the road ahead was closed to the blocked road gate, then would bounce back the other way. Some obviously perplexed there really were no shops for refreshments, food, or trinkets, anywhere along the long drive, not even a Coke machine? Yes folks, welcome to Death Valley! And in case of trouble don't bother trying to call 911 because it is a long ways from any cell phone service. Most would stop at least a few minutes where other cars were roadside enjoying the fragrant yellow expanses before continuing back north to civilization at Furnace Creek. There also isn't any shade one might park a vehicle beneath for miles. Thus for many from urban worlds, the raw nature may be a bit too much to deal with beyond a few minutes. The prime stopping zone was a bit past the Harry Wade dirt road right angle junction because that is where the wildflowers tend to be densest close to the roadside and where they see other cars parked. Of course lots of smartphones sticking up at arm's length for selfies and pointing at groups of people posing in front of the yellow flowers. I watched but the bravest only hiked out about 100 feet from the pavement. I wondered how many people standing by the road wondered if it was environmentally acceptable to wander off from the road edge lest they squash some plant? Were they going to be fined or given the evil eye by others standing along the road? Or how many were conjuring up imagined dangers like gopher holes to sprain an ankle in, rattlesnakes, coyotes, saber-toothed pack rats? A behavior I had noticed during mornings while I was hiking about was that people did seem to notice this guy with a tripod and large daypack cavorting hundreds of yards out beyond and a few groups then did start their own adventures. I wondered about suggesting to the park to put up a sign saying, its ok folks, its safe, to walk out into the flower fields and elsewhere along Death Valley roadsides. I parked roadside well north of the Harry Wade junction where no one else was for a half mile, opened the left side doors, draped one of my two sleeping bags over the windshield, and a blue plastic tarp over the passenger side windows by stuffing parts through the inch wide opening at top, while opening the rear Forester door to let the breeze run through. For about 2 hours ate lunch, read, attended to gear issues reviewed some camera images, strolled about the area a bit, and napped. Amusingly despite the fact other vehicles had not been parking along this section of highway, it was not long before several other cars were now parking along this same stretch too. Then mid afternoon I drove off to an area along the Jubilee Pass Road with nice areas of sandverbena and as the breeze waned somewhat, shot the... image at page top. A reflection of how few people and more serious photographers had visited areas along the road to this point was despite this sandy area being right along the paved road and in my opinion was easily the most aesthetic section along the road east of the Harry Wade Road junction, there were virtually no footprints yet in the sand. 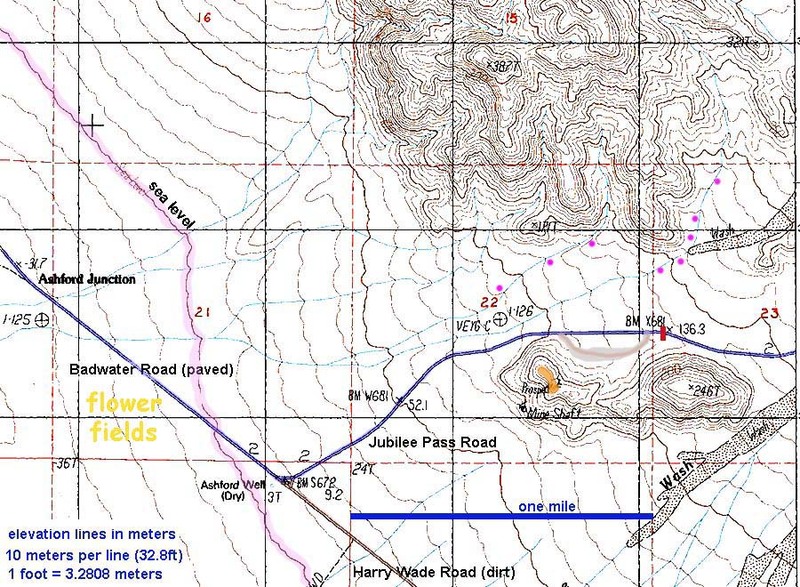 For those looking for a location to legally disperse camp at in this zone, one can drive about 1.6 miles along dirt Harry Wade Road from the paved road junction where there are flats roadside within a wash. And note throughout the park there are short 4WD spur roads not on any maps only those that explore dirt back roads will find. As murky high clouds increasingly muted decent landscape light, drove off to the same location I'd camped at Friday. Late that breezy afternoon, I did explore the beautiful camp zone quite a bit that has rather complex terrain with much to photograph. 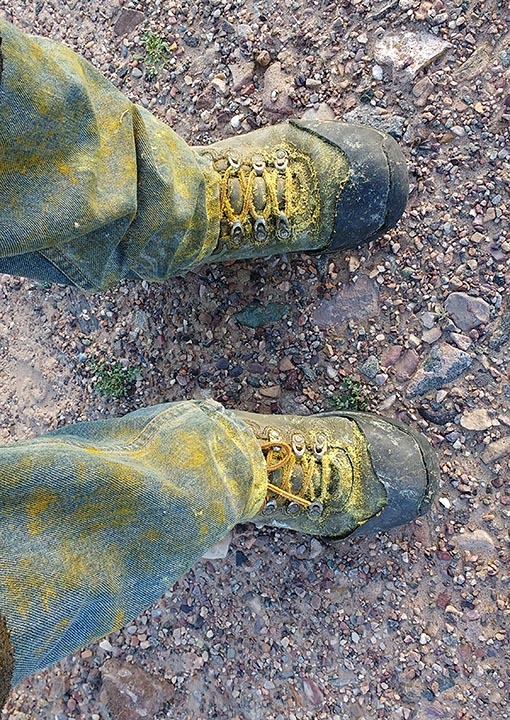 Look at all the fragrant yellow pollen I'd picked up on my Levi 501 pant legs and Vasque Bitterroot boots. 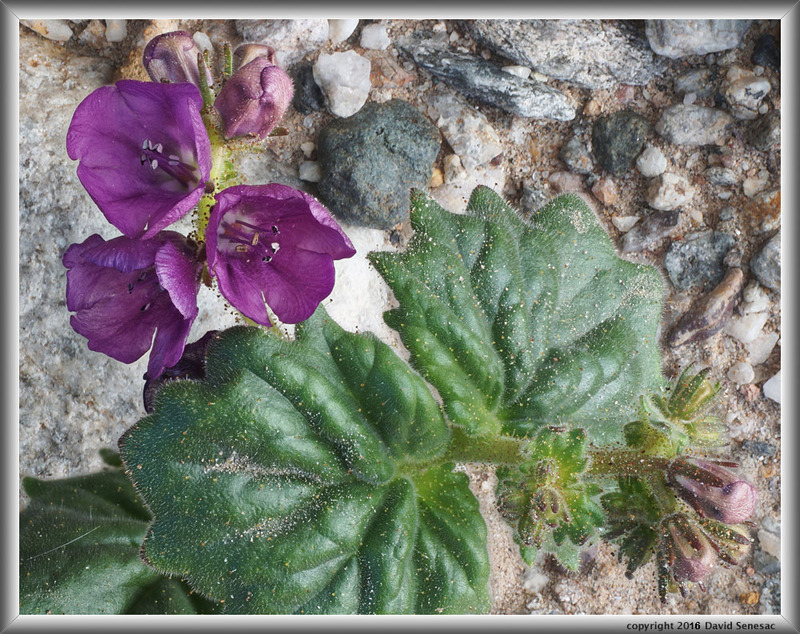 The brown-eyed evening primrose was most of that on the boots while the desertgold higher up on the shins. In the wash I set up to sleep inside the Forester instead of under the stars. Without setting up my tent, it would be easier to read books in the evening on my Kindle or under the dome light plus I was now charging camera batteries through the cigaret lighter outlet through the night, needing to monitor when to swap a new one in.